The digital and information age is propelling the HR processes today to seek complete automation. Touching upon a plethora of activities such as Employee Hiring, Remuneration, Employee Motivation, Employee Maintenance, Industrial Relations and Employee Prospects, all of which fall under the common banner of Human Resource Management (HRM), human resources today stands as the vital factor which binds and holds every organization into a workable structure and which plays a pivotal role in ensuring their success. Consequently, many today have come to understand the importance of selecting and recruiting the right people as well as investing in the right HR services and software solutions, to boost their organizations’ prospects of succeeding in an increasingly competitive business landscape. Corroborating this fact are research reports which forecast the global core HR Software market to reach USD 9.89 billion by 2022 and the global HRM market to hit USD 30 million by 2025, respectively. However, even with these advantages, recruitment teams and professionals still face many challenges in creating efficient recruiting processes, attracting and engaging the right qualified candidates, hiring fast enough to avoid the delayed operations that come with vacant positions, understanding and effectively using recruitment software and data-driven recruitment, and recruiting fairly with diversified strategies. Perfectly understanding these challenges and endeavoring to address them, Bangalore headquartered Wolves India steps forward with its extensive recruitment expertise and an inclusive portfolio of Recruitment Services and technology,to revolutionize the way firms recruit and manage their resources today. “In essence, we believe that we have a dual responsibility – of representing the client when we speak to the candidate and representing the candidate when we interact with the client. We take pride in meeting manpower needs that require niche and highly specialized skill sets,” adds Raghu Shivakumar, Co-founder & Recruitment Consultant, Wolves India. "Having The Right Person To Do A Specific Function Is Paramount As The Right Employee Builds Up The Organization While A Wrong Hire Can Result In Dissatisfaction To Both The Candidate And The Employer"
In alignment with these demands, the company has been working since 2014 to bring a new approach to Recruitment and has partnered with some of the largest Fortune 500 companies in the world to help them build a solid talent pool. Raghu strongly believes that his company is a reflection of the companies that they have associated with and hence choosing a client takes a lot of deliberation. The company has a set process in place where the team studies the gamut of industries, pick out the firms that are not only in tune with Wolves culture, but also those whose culture Wolves would like to emulate. Post the close observation of the market, a tailored set of questions are prepared to understand the organisation’s business and what services are required and how the potential client can be assisted. The company has catered to some of the renowned organizations like EY, ANSR, MAERSK, STATE STREET, Goodera, Infosys, Star Network, We Work and the likes. Wolves has accomplished this with the help of its expansive portfolio of offerings that includes IT & ITES Recruiting Services, Project Management, Leadership Hiring, RPO & Staffing, HR Shared Services, Financial Shared Services, Captive Banking, Business Analytics & Consulting, and Support services. The company also uses technology tools like AI-powered Outreach Tracking advanced technology platforms like HIRE by Google for its internal CMS and GLIDER.ai to evaluate its candidates. The company also has a rating system wherein it is sent out to its candidates after they meet the client. “We have this process where in we calculate Net Promoter Score which is an index that measures customer satisfaction. As compared to similar indexing done by other businesses weighing the inputs of their clients, Wolves in this case talks to its candidates and qualifies them. We link that to the recruiter’s bonus plan. So, it is not all about fees only, but also about the satisfaction of the customer. That has been a game changer,” says Raghu. Not just stopping there, Wolves also seeks to specialise in hiring across Job Levels. As per analytics, in the past, the team has effectively engaged in hiring for mid level to top level management. In conjunction with this, the company has allocated a team that ceaselessly works at hiring for language specialists, especially for Japanese and Bahasa at all levels and domains. The company has dedicated teams working on a broad range of projects in corporate functions wherein entire teams have been set up within a short time frame. 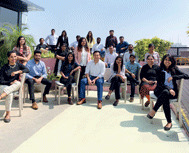 While Wolves continually propels itself to deliver leading-edge services and help in finalizing the right candidate, the company also cultivates a positive work culture within its own workspace. The founders sit with the team at the same bay area and have discussions, promoting self growth and encouraging personal goals. “We make it a point to discuss our personal goals and try to achieve those goals in a set period of time. A lot of learning is imparted on a day to day basis, which one does not have access to in a paid course. All of us know and value the importance of constant upgradation of field-related knowledge,” says Raghu. The company balances fun activities and work thatis the key to yielding a high performing team. Continually striving to maintain its leading position in this domain, the company promises to continue to deliver the perfect blend of advancing technologies and the right skill set.